The aryl hydrocarbon receptor (AhR) is a ligand-dependent transcriptional factor able to sense a wide range of structurally different exogenous and endogenous molecules. AhR ligands vary in their structure, and their binding affinity can significantly differ between mouse and human AhR . AhR agonists have been found to arise from xenobiotics such as polluants, and indoles mainly derived from tryptophan metabolism occurring in the stomach and in the gut, as well as in other organs upon photo-oxidation or oxidative stress. The prototypic high affinity AhR agonist, the xenobiotic 2,3,7,8-tetrachlorodibenzo-p-dioxin (TCDD), displays a 10-fold higher affinity for mouse AhR compared to human AhR. 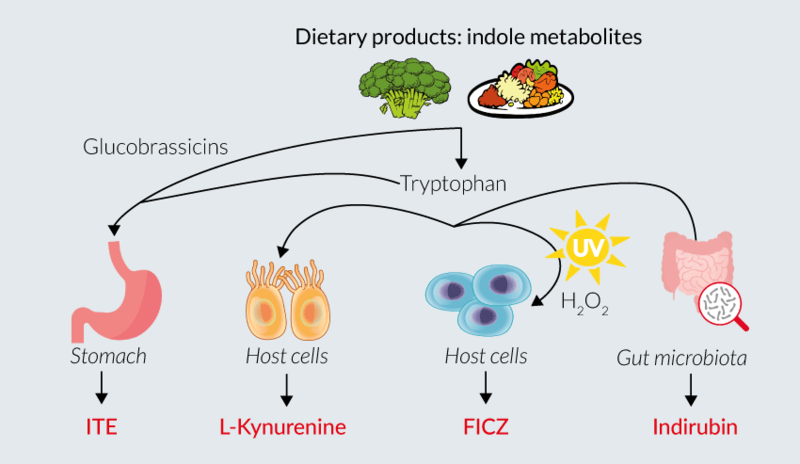 Conversely, dietary-derived indole metabolites have a better affinity for human AhR; a possible consequence of evolution [1-3]. The activity of all AhR ligands is validated using AhR Reporter Cell Lines. Read our review on AhR’s key role in the intestinal microbiota and immunity. 1. Lamas B. et al., 2018. Aryl hydrocarbon receptor and intestinal immunity. Mucosal Immunol. 11(4):1024-38. 2. Murray I.A. et al., 2017. Ligand activation of the Ah receptor contributes to gastrointestinal homeostasis. Curr. Opin. Toxicol. 2:15-23. 3. Hubbard T.D. et al., 2015. 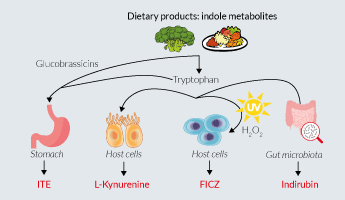 Indole and tryptophan metabolism: endogenous and dietary routes to Ah receptor activation. Drug Metab. Dispos. 43:1522-35.